Quintessentially British design and exquisite craftsmanship combine with the vintage-inspired Emmy London collection. This sparkling diamond set ring is styled in 9ct white gold with elegant milgrain detailing on the side of the band, and a secret diamond on the inside. Featuring I1 certified diamonds and an independent GSI certificate. 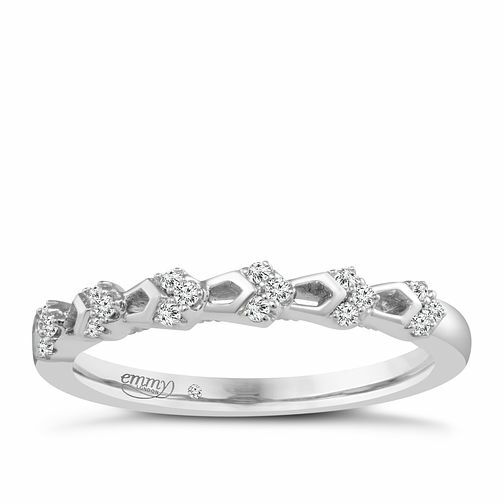 Emmy London 9ct White Gold Diamond Ring is rated 4.3 out of 5 by 3. Rated 5 out of 5 by Anonymous from Beautiful simple band I absolutely love it! Was abit hesitant as I had to order it online because the size wasn’t available in any store closer to me, but it was much better than I expected! Simple, sleek and just the right amount of shine! And to top it all off, got it at a great price!